Cuisinart DBM-8 vs. CBM-18N Conical Burr Grinders Comparison Between ROK Presso vs. Handpresso. Which Of These Manual Espresso Makers is Best? Breville Barista Express vs. Rancilio Silvia, What’s The Difference? The Barista Express is a semi-automatic that features a built-in conical burr grinder for a great bean to cup experience. The Silvia is a traditional manual espresso maker with classic commercial design, with NO built-in grinder. The built-in grinder automatically doses and grinds the exact amount you need for the perfect shot of espresso. A cradle holds the portafilter for you, for hands-free grinding. a steam gauge shows you exactly when your machine is ready for steam or extraction. The machine is fully pre-set for the perfect espresso extraction, but you can override all presets and create your own. a dedicated hot water dispenser perfect for making tea, soup or basically anything that requires hot water, right away. With the Barista Express, you’re ready to extract a delicious and aromatic shot of espresso out of the box! The machine makes sure all setting are set in a way that you’ll make great coffee every time. And as you start to learn the difference between settings, you have complete freedom to change them and tweak them as you like. It also comes with everything you need included: filters for a single or double shot, coffee scoop, stainless steel frothing jug and cleaning discs. 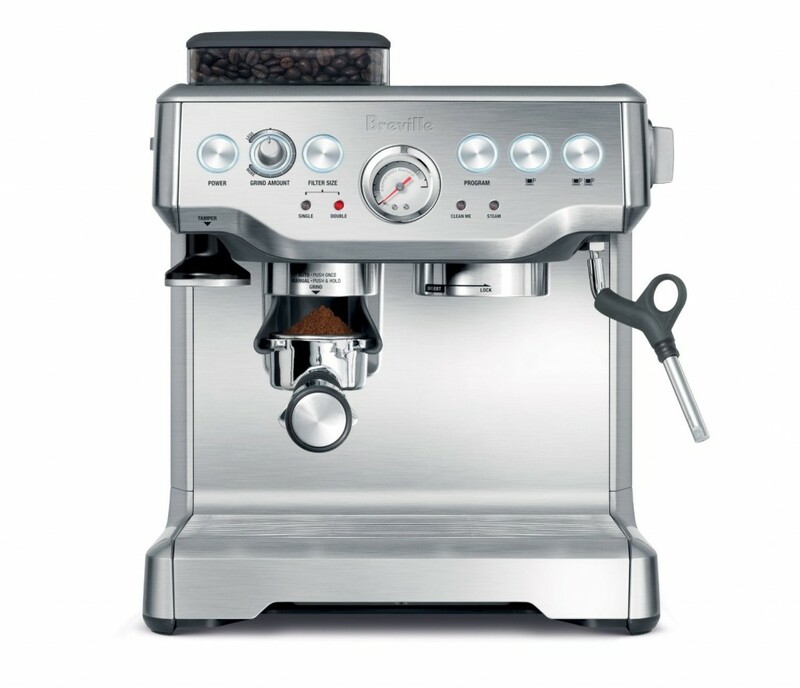 Click here to learn more about the Breville Barista Express, read the customer reviews and buy it. You’ll notice it features a lot of switches, everything in the machine is operated manually. You’ll need to start and end your shot manually. Since there’s no steam gauge, you’ll also have to know when to switch between extraction and frothing. Included with the machine: filters, coffee scoop and tamper. In our opinion, the Silvia requires a lot of knowledge to start with. If you’re new at this, you’ll need to expect a few bad shots until you finally perfect it. And since a great espresso shot starts with great coffee ground, you’ll need a top notch conical burr grinder, which should add $100 to $200 to your budget. Also, you’ll need to get your own frothing jug, but since those don’t cost over $10, it’s nothing to worry about. 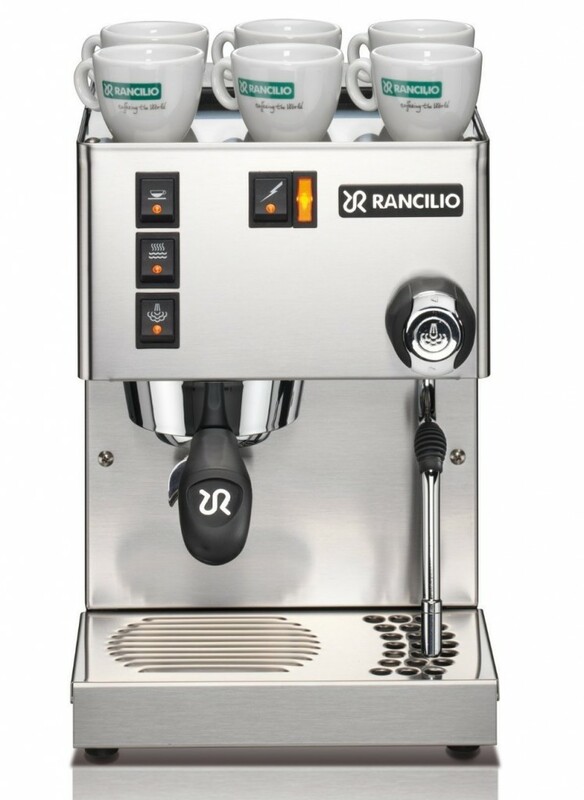 Click here to learn more about the Rancilio Silvia, read the customer reviews and buy it. We highly believe that the Barista Express holds a lot value for the money than the Rancilio Silvia. It is less expensive than the Silvia, yet it packs everything you need for your at-home coffee experience: the espresso maker, the grinder and the accessories. It is also easier to use, gives you the freedom to program it as you like, or let it work automatically. For that, the Barista Express is an easy winner.